This is a Chinese name; the family name is Tan (Chinese :陈; pinyin :Chén). Laurentia Tan Yen Yi BBM PBM ( /lɒˈrɛnʃə/ lo-REN-shə; Chinese :陈雁仪; pinyin :Chén Yànyí, pronounced [tʂə̌n jɛ̂n í] ; born 24 April 1979), is a United Kingdom-based Singaporean para-equestrian competitor. Tan developed cerebral palsy and profound deafness after birth, and moved to the United Kingdom with her parents at the age of three. She took up horse riding at age of five years as a form of physiotherapy. She subsequently completed her A-levels at the Mary Hare Grammar School, a residential special school for the deaf, and graduated with an honours degree from Oxford Brookes University in hospitality management and tourism. The Bintang Bakti Masyarakat, instituted in 1963, is awarded to any person who has rendered valuable public service to the people of Singapore, or who has distinguished themselves in the field of arts and letters, sports, the sciences, business, the professions and the labour movement. 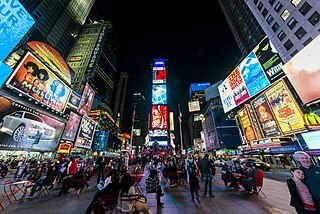 Bars may be issued for further service. The Pingat Bakti Masyarakat is a Singaporean national honour. It was instituted in 1973. The medal may be awarded to any person who has rendered commendable public service in Singapore or for his/her achievement in the field of arts and letters, sports, the sciences, business, the professions and the labour movement. 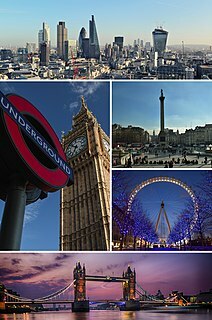 Hartpury is a civil parish in Gloucestershire, England. It has an area of about 3,500 acres (1,400 ha), about 270 homes and a population of about 700 people, increasing dramatically to 1,642 at the 2011 census The village is about 5 miles (8 km) north of Gloucester. Geographically the parish is in Leadon Vale; administratively it is in the Forest of Dean. Hartpury also presents beautiful walks and strolls through the countryside. It has all the usual facilities; Post Office, a school, church and a vets. Hartpury College is based in the village. The village contains several interesting buildings including the former home of the Canning family, Hartpury House, now part of the college. Hill House, also known as The Hill, is a large timber framed house which contains a very fine 16th Century oak staircase and several plaster ceilings of the same period. The 2008 Summer Paralympic Games, the 13th Paralympics, took place in Beijing, China from September 6 to 17, 2008. 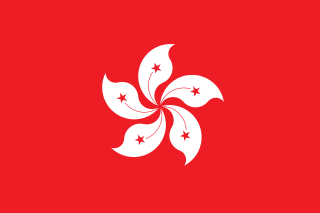 As with the 2008 Summer Olympics, equestrian events were held in Hong Kong and sailing events in Qingdao. ↑ Athlete biography: TAN Laurentia, Beijing 2008 Paralympic Games, Beijing Organizing Committee for the Games of the XXIX Olympiad, 2008, archived from the original on 16 March 2009, retrieved 13 September 2008 . 1 2 3 4 Tan Yo-Hinn (12 September 2008), "Tan's bronze shine: Thanks to mum and dad's resolve, this Singaporean is now a star athlete", Today , p. 53, archived from the original on 1 October 2008 . 1 2 3 4 5 Jeanette Wang (11 September 2008), "Laurentia, the perfectionist: Paralympic medallist lip-reads, insists on eating with chopsticks", The Straits Times , p. A9 . ↑ The Diamond Centre for Disabled Riders: Who we are, Diamond Centre for Disabled Riders, archived from the original on 4 September 2012, retrieved 4 September 2012 . 1 2 3 4 Jeanette Wang (10 September 2008), "First medal for S'pore: Tan claims equestrian bronze, also Asia's first, at the Paralympic Games", The Straits Times, p. B14 . ↑ Compare Speech Day awards 2007, Mary Hare Secondary School, 2007, archived from the original on 2 October 2008, retrieved 2 October 2008 . ↑ Mary Hare history: Speech Day 1995, Mary Hare Grammar School, 2007, archived from the original on 5 January 2009, retrieved 13 September 2008 . ↑ Siow Li Sen (13 September 2008), "Grooming disabled riders", Business Times (Singapore) . ↑ Dressage rider Laurentia Tan qualifies for the 2008 Hong Kong Para-Olympics [sic]!, Riding for the Disabled Association Singapore, 22 August 2007, archived from the original on 18 December 2008, retrieved 11 September 2008 . 1 2 Jeanette Wang (12 September 2008), "Bronze once again: Tan can't hear music but she and horse 'dance' their way to 2nd medal", The Straits Times, p. B21 . ↑ Tan Yo-Hinn (12 September 2008), "Paralympics: Singapore's Laurentia Tan wins second Equestrian bronze", Channel NewsAsia , archived from the original on 12 September 2008 . ↑ See also First Paralympian for Singapore emerges today – Laurentia Tan, Singapore Disability Sports Council, 9 September 2008, retrieved 13 September 2008 ; Tan Yo-Hinn (10 September 2008), "Tan the history-maker: She keeps her cool to win Singapore's first Paralympic medal", Today, p. 32, archived from the original on 1 October 2008 ; Low Lin Fhoong (11 September 2008), "Tan aims for No 2: One bronze in the bag, equestrian ace could taste more glory today", Today, p. 49, archived from the original on 1 October 2008 ; Roundup: British, German riders become biggest winners in Para-equestrian Freestyle, Xinhua News Agency, 12 September 2008, archived from the original on 15 September 2008 . ↑ Liang Kaicheng (12 September 2008), "So proud, but why focus on disability? ", The Straits Times . ↑ Yong Ming Han (12 September 2008), "Why so little attention paid to Paralympic bronze? ", my paper (reproduced at AsiaOne), p. A28, archived from the original on 5 June 2011 . See also Leo Chen Ian (President, Disabled People's Association) (22 September 2008), "The value of gold: Paralympians put in as much effort as Olympians do", Today, p. 22, archived from the original on 1 October 2008 , which also appeared as "Disabled appeal for more media coverage [letter]", The Straits Times, p. A36, 20 September 2008 . ↑ Chua Sin Bin (12 September 2008), "She deserves even more", Today, p. 38, archived from the original on 1 October 2008 . ↑ Chia Yong Yong (17 September 2008), "Offer them equal treatment", The Straits Times, p. A23 . See also Leonard Thomas (18 September 2008), "Stars who break down barriers", Today, p. 49, archived from the original on 1 October 2008 . ↑ Jeremy Au Yong (17 September 2008), "Top disabled athletes get far more funding", The Straits Times, p. B9 . 1 2 Tan Yo-Hinn (17 September 2008), "Paralympic hopefuls in line for more support", Today, p. 43, archived from the original on 1 October 2008 . See also Marc Lim (18 September 2008), "M.A.P. 's new route: NSAs will get 20% cut of monetary award, some payouts reduced", The Straits Times, p. B14 ; Sim Chi Yin (18 September 2008), "Paralympians' feats inspire entire country", The Straits Times, p. B14 . ↑ Valerie Chia (21 September 2008), "Joy ride for Paralympians", The Sunday Times (Sport), p. 33 ; Lin Xinyi (21 September 2008), "Historic reception", The Sunday Times (Sport), p. 33 . ↑ Jeanette Wang (22 November 2008), "More for medallists: Paralympians Pin Xiu, Goh [sic: Tan] get double the prize money in award scheme", The Straits Times, p. C30, archived from the original on 2 December 2009 ; Tan Yo-Hinn (22–23 November 2008), "Paralympic stars Pin Xiu and Tan get cash boost", Today, p. 48, archived from the original on 23 November 2008 . ↑ Leonard Thomas (31 December 2008), "The brightest star of all: Table tennis star Li Jiawei is TODAY's Singapore Athlete of the Year 2008", Today, p. 24, archived from the original on 1 January 2009 . ↑ Her World Woman of the Year 2008: Media Release, SPH Magazines, 6 March 2009, archived from the original on 16 March 2009 ; Grace Chua (7 March 2009), "Her World Woman of the Year: Not the final curtain call yet: A pioneer in the arts world, Goh Soo Khim's love for dance continues", The Straits Times . 1 2 3 Terrence Voon (4 September 2012), "Tougher ride this time: Tan and her young horse have worked together for only 10 months", The Straits Times, p. B18 ; Alywin Chew (4 September 2012), "Laurentia Tan bags bronze medal: 33-year-old, who won bronze in Beijing Games, comes in third again in equestrian event", Today, p. 2, archived from the original on 4 September 2012 . See also Rohit Brijnath (4 September 2012), "Victory lies in Tan's duel with life", The Straits Times, p. B18 . 1 2 May Chen (6 September 2012), "Cool Tan's performance was inspiring, says Teo", The Straits Times, p. B20 ; "Paralympics: Laurentia Tan scores a silver: Success in Individual Freestyle Test makes Tan Singapore's most bemedalled Paralympian ever", Todayonline.com, 5 September 2012, archived from the original on 6 September 2012 ; Alywin Chew, "Living in a silent blockbuster", Today, p. 54, archived from the original on 6 September 2012 . ↑ Shanta Danielle Arul (5 September 2012), "Why the big disparity in cash rewards? [letter]", The Straits Times, p. A21 ; Liew Khai Khiun (5 September 2012), Paralympic heroes deserve more [letter], Straitstimes.com, archived from the original on 5 September 2012 ; Terrence Voon (6 September 2012), "Call for equal rewards: Many want Paralympic medallists to reap same rewards as Olympic winners", The Straits Times, p. B20 . ↑ Sanjay Nair (16 November 2012), "Tan aiming higher for Rio", The Straits Times, p. C14 ; see also Alywin Chew (16 November 2012), "Brazil in her sights", Today, p. 74, archived from the original on 16 November 2012 . Tao Li is a Singaporean competitive swimmer who specializes in the backstroke and butterfly. The following lists events that happened during 2008 in the Republic of Singapore. Equestrian at the 2008 Summer Paralympics consisted of eleven dressage events. The competitions were held in the Hong Kong Olympic Equestrian Centre from 7 September to 11 September. Singapore sent a delegation to compete at the 2008 Summer Paralympics in Beijing, represented by six athletes competing in four sports: swimming, sailing, equestrian and athletics. 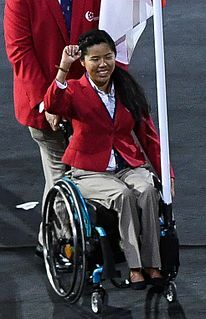 The country's flagbearer at the Games' opening ceremony was supposed to be Desiree Lim, a sailor. However, as the sailing events were held in Qingdao, it was Theresa Goh (swimming) who was the flagbearer on that day. 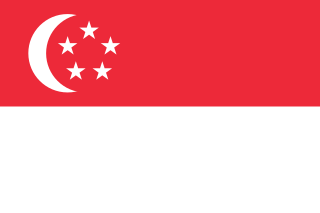 The 2008 Summer Paralympics marked the first time Singapore had won a Paralympic medal of any kind. Feng Tianwei is a Singapore table tennis player. She moved to Singapore under the Foreign Sports Talent Scheme in March 2007 and commenced her international career in competitive table tennis the following month. Theresa Goh Rui SiPBM is a Singaporean swimmer and Paralympic medalist, with a bronze in the SB4 100m breaststroke at the 2016 Summer Paralympics. She holds the world records for the SB4 50 metres and 200 metres breaststroke events. Anne Patricia Dunham OBE is a British Para-equestrian who has competed in the Paralympic Games. 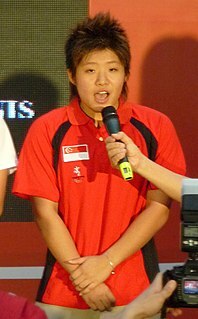 Yip Pin Xiu, PJG is a Singaporean backstroke swimmer. She is a three-time Paralympic gold medallist and a one-time IPC gold medallist, with two world records in the 50 m backstroke S2 and the 100 m backstroke S2. Sophie Margaret Christiansen, is an English equestrian who has competed in three successive Paralympic Games, winning numerous medals. In 2012 and 2016 she gained three gold medals at the paralympics. Rosalie Fahey is a Paralympic equestrian competitor from Australia. She won a bronze medal at the 2000 Sydney Games in the Mixed Dressage – Championship grade I event. Joann Formosa, is an Australian Para-equestrian, who won a gold medal at the 2012 London Paralympics. Hannah Dodd is an Australian Grade IV equestrian and 1.0 point wheelchair basketball player who represented Australia in equestrian at the 2012 Summer Paralympics in London, coming 11th and 12th in her events. Switching to wheelchair basketball, she made her debut with the national team at the Osaka Cup in February 2015. Grace Bowman is an Australian equestrian. She was selected to represent Australia at the 2012 Summer Paralympics in the equestrian event. She did not medal at the 2012 Games. Natasha Baker MBE is a British para-equestrian who won two gold medals at the 2012 Summer Paralympics, and 3 at the 2016 Summer Paralympics. Hannelore Brenner is a German Paralympian dressage equestrian athlete. Lauren Barwick is a member of the Canadian Equestrian Team, in grade II Para-Dressage, who has competed in the 2004, 2008 and 2012 Paralympic Games. She won three medals in those games. Barwick has featured in CBC's Heartland and has several awards. Susan Seipel is an Australian Para-canoeist, a gold and bronze medallist in kayak and outrigger canoe at the 2015 and 2016 World Championships. She won a bronze medal at the 2016 Rio Paralympics. Singapore competed at the 2016 Summer Paralympics in Rio de Janeiro, Brazil, from 7 September to 18 September 2016. Nicola Tustain is a retired Welsh Paralympic dressage rider. During her career, Tustain won multiple para-dressage medals at the World Championships and Paralympic Games. She was named a Member of the Order of the British Empire in 2010. Tan Yo-Hinn (12 September 2008), "Tan's bronze shine: Thanks to mum and dad's resolve, Singaporean is now a star athlete", Today, p. 53, archived from the original on 1 October 2008 . Wang, Jeanette (10 September 2008), "First medal for S'pore: Tan claims equestrian bronze, also Asia's first, at the Paralympic Games", The Straits Times, p. B14 . Wang, Jeanette (11 September 2008), "Laurentia, the perfectionist: Paralympic medallist lip-reads, insists on eating with chopsticks", The Straits Times, p. A9 . Profile: (Ms) Laurentia Tan Yen Yi (PDF), Fédération Équestre Internationale (International Federation for Equestrian Sports), 2008, archived from the original (PDF) on 26 July 2011, retrieved 17 September 2008 . Gwee, Stephanie (17 November 2007), "Giving out doses of four-legged therapy", The Straits Times (reproduced on AsiaOne) . "Making up for lost time", Today, p. 56, 7 June 2008 . Tan, Laurentia (2 September 2008), Riding with nothing to lose [blog], Straitstimes.com, archived from the original on 16 July 2011, retrieved 13 September 2008 . With Nothing to Lose, Tan rides into history, Beijing 2008 Olympic and Paralympic Equestrian Events in Hong Kong, Beijing Organizing Committee for the Games of the XXIX Olympiad, 10 September 2008, archived from the original on 7 July 2011, retrieved 21 December 2010 .